You know why else French people don’t get fat? Because they invent recipes wherein you fight with eggs. Eggs are small but they’re tough and it’s always a toss up as to who’ll win. I’ve whisked egg whites into peaks that make it through soufflé-ing, and for this dish I just pushed two hard-boiled eggs through a fine mesh strainer. Which, although not complicated, is a not bad workout for the bicep of your dominant arm. 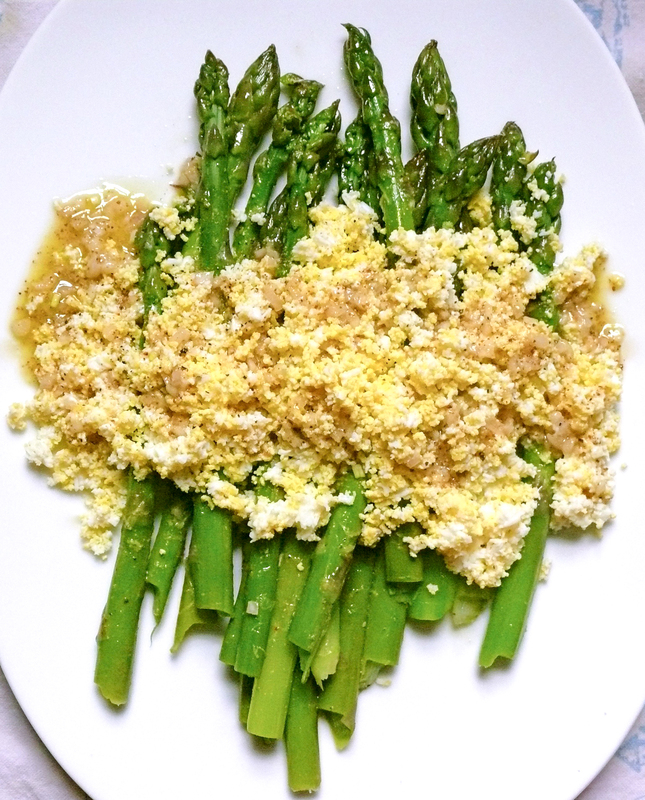 I’m not complaining about the effort it takes to make “couscous-like” eggs, as James put it, for asparagus mimosa. These eggs are light as air after being sieved and I love the French for simultaneously elevating two ingredients in one simple, classic dish. You just boil some asparagus for about 4-5 minutes, and transfer them to an ice bath. Then add two room-temperature eggs to the boiling water for 10 minutes. Meanwhile, mince half a shallot, add it, salt, pepper and a dollop of Dijon mustard to a healthy glug of white wine vinegar (a tarragon vinegar is traditional here, but you could also muddle some fresh tarragon into your dressing) and then stream in a generous amount of extra virgin olive oil while you whisk. Taste and adjust the seasoning in this, your French vinaigrette, and drizzle half of it evenly over the asparagus stalks (pat them dry first if they’re not by now). Dunk your eggs in the ice water when they’re done, peel and pass (grate/push) through a sieve (focus on how pretty the eggs look when you start to curse, about 30 seconds into this process). Then season them to taste, sprinkle them across the asparagus and pour the remaining dressing on top. As you enjoy this lovely meal, you can ponder how to seriously work your other bicep now. I may attempt to open wine bottles with my weaker arm. That should balance things out in no time. Previous Articledear yas, your food tastes like cow brains.